Many of the International Milling Directory‘s members met with Darren, Tuti and Roger from the publication (and to discuss the sister publications International Aquafeed and Grain & Feed Milling Technology). One comment from the event organiser, “With 2,445 exhibitors and around 160,000 visitors, including 38,000 international visitors, EuroTier 2012 has reached new record levels”, announced Dr. Reinhard Grandke, Chief Executive Officer of DLG (Deutsche Landwirtschafts-Gesellschaft – German Agricultural Society), speaking to the press in Hanover at the close of EuroTier on 16 November 2012. With this result EuroTier has impressively demonstrated its great pulling power for animal husbandry farmers and experts from all over the world and further consolidated its leading position as the world’s top event for professional animal husbandry. BioEnergy Decentral at EuroTier has become firmly established as the world forum for decentralized energy supply. The number of exhibitors has increased by 25 percent compared with 2010. Altogether 2,445 direct exhibitors and 41 additionally represented firms from a total of 51 countries presented their goods and services and their innovations. Around half of the exhibitors (1,151) came from outside Germany, representing a 40 percent increase over 2010. This underpins EuroTier’s unique position as the world’s largest exhibition in this field. EuroTier is more international than ever before. 38,000 farmers, investors and expert visitors came to the Exhibition Grounds in Hanover to gather information. This corresponds to an increase of over 50 percent by comparison with the previous maximum level. The largest contingents of international visitors came from the Netherlands, Austria, Denmark, France, Poland, Spain and the United Kingdom. Nearly 3,000 investors and persons in charge of large-scale farms from Eastern Europe came to Hanover to see what is available on the market. The high numbers of visitors from the Middle and Far East Asia as well as from Central and South America also deserve mention: over 7,000 visitors from these regions were registered. The total visitor numbers from Germany remained constant at around 122,000. The “World Poultry Show” at EuroTier completely satisfied its goal of being the global forum for the poultry sector. Breeders, producers and processors from all over the world used the comprehensive and highly specialised programme to develop the good prospects in the markets. The Technical Programme at EuroTier 2012 was very well attended by the visitors. The international events for the dairy and pig farmers and the International Poultry Day immediately preceding EuroTier have become established highlights for practical farmers and related specialists from all over Europe. They attracted around 1,300 international experts. The conferences and forum events and the congress of the Federal Association of Practising Veterinarians (Bundesverband Praktizierender Tierärzte) held overlapping with EuroTier also provided excellent opportunities for exchanging opinions and experience. The “Young Farmers Day” on Thursday was a great success. Over 5,000 young farmers and students from Germany and abroad attended the various events offered at EuroTier. One highlight of EuroTier 2012 was once again the Young Farmers party with around 2,500 young guests. BioEnergy Decentral reported a constant number of around 42,000 visitors, despite the current market situation in Germany. The share of international visitors increased by twelve percent compared with 2010, which is attributable above all to the technology leadership in this industry. Accordingly it was possible to expand BioEnergy Decentral as the global forum for decentralized energy supply. The partnership with VDMA Power Systems and the Association of Local Utilities (VKU) has proved fruitful and contributed substantially to the success of BioEnergy Decentral. 650 exhibitors presented solutions for the entire value chain of decentralized energy supply. The programme of BioEnergy Decentral was complemented by a comprehensive technical programme that was designed and implemented by DLG in partnership with Bauförderung Landwirtschaft – BFL (an organization devoted to promoting agricultural building construction and optimizing livestock management conditions), the publisher Energie & Management and further partners. This story was from Engormix . The next EuroTier including BioEnergy Decentral will be held in Hannover, Germany from 11th to 14th November 2014. We look forward to going again and I hope it is reciprocated by you. 4B has invested in tooling to increase the capacities of their popular STARCO steel elevator buckets; as a result, all 4B’s ow have the same or greater capacities than comparable buckets of their competitors. The Starco bucket was originally invented by 4B Braime’s French subsidiary, SETEM, in the 1980s and was the first low profile elevator bucket to use centrifugal discharge on a parabolic elevator head to achieve much higher capacities on a given elevator leg. As such, the STARCO bucket has revolutionised the elevator buckets market. The Starco elevator bucket has been engineered to provide perfect fill & discharge for a wide range of products. It operates at wide speed range, up to 4.55m/s. It is not surprising that the STARCO bucket has become a very popular bucket, and has been copied by a number of companies, with varying results. In a range of tests that 4B has carried out to compare their own 4B STARCO buckets with their competitors’ buckets, it has become clear that a lots of buckets actually have a lower capacity than what is claimed on paper; also the quality of the bucket itself can be very different depending on the production process and the quality of the steel used. Great care should be taken when selecting a STARCO bucket (or a similar model). On request, 4B can provide test results and field evidence to show the differences between different models. Go 4B is a listed member in 11 categories of the International Milling Directory. Find their entry here. International Milling Directory members may be interested to know that as part of the 2013 International Production & Processing Expo (IPPE) education schedule, the Meat and Poultry Research Conference will focus on the new economic reality presented by natural and organic products, addressing topics from regulatory and animal management challenges to processing and ingredients issues. The registration fee for the program is $150 for all Expo attendees. Co-sponsored by the American Meat Institute, U.S. Poultry & Egg Association, the American Meat Science Association, and the Poultry Science Association, the Meat and Poultry Research Conference serves as the leading forum for presenting the most current meat and poultry production research and its direct application to the industry. The conference will present cutting-edge science in practical, applied ways. The 2013 IPPE, one of the world’s largest poultry, feed, and meat industry events, will be held from January 29-31, 2013, at the Georgia World Congress Center in Atlanta, GA. The Meat and Poultry Research Conference is scheduled from 8 a.m. – 5 p.m. on Thursday, January 31. For more information on the program, click here. To register for the event, go to www.ipe13.org. Milling International, the blog for the International Milling Directory has learned that the Bühler Technology Group will from January 1 2013 concentrate the core functions of its Malting market segment currently located at its two German sites in Braunschweig and Beilngries at the headquarters of its Grain Logistics business unit in Beilngries. This concentration at a single site will enable technological know-how to be focused, processes to be fine-tuned, and the number of interfaces to be reduced. This stands to strengthen the competitiveness of the Malting market segment in view of meeting future market challenges. All employees in Braunschweig affected by this change will be offered a new job in Beilngries. Bühler are one of International Milling Directory’s largest listed companies. Check out their listing and expertise in all areas today. Pancosma participated in EuroTier 2012 exhibition from November 23-26, 2012 in Hannover, Germany. With a modern booth of 80m2,segmented into 4 different hubs, the company put in light its leading ranges : the palatants range (incl. SUCRAM® and Tek), the minerals (B-TRAXIM®) and the plant extracts (XTRACT®). The team also organised daily cocktails which were a real success especially with the venue of 30 Chinese customers and of its Taiwan distributors (ASPI) joined by 20 farmers-integrators of this country. Mrs Sonia Soares (Marketing Director) and Mrs Jennifer Maurin (Communication Manager) had the opportunity to meet all their media partners. In this context, they met the team of Perendale Publishers represented at their booth by Mrs Tuti Tan and Mr Roger Gilbert. It was the opportunity to discuss the new outlooks especially for Aqua feed market. To conclude Mrs S. Soares states “Looking at the number and variety of persons who visited us and at all the interesting discussions that we had during this full week, this EuroTier exhibition has been a real success for our group and has to be renewed”. Co-ordinators Column: November 30, 2012. Hello and welcome to the IMD newsletter on what is a bitter winters morning here at IMD HQ in the UK. More editions of IMD21 have been sent out in the past couple of weeks with our storage beginning to look a little bare (we have considered renting the space out to Santa Claus), so be sure to visit www.internationalmilling.com and order yours today. As you will notice we have had some new additions to our listed companies in IMD this month so I would like to extend to them a warm welcome from all of us here at IMD HQ. We are still sifting through lots of information and feedback from EuroTier 2012 which, took place in Germany earlier this month. We were delighted to have worked with the organisers there as media-supporter for the event and having met so many of you it has given us all plenty to be optimistic about for 2013. Over the coming weeks you will notice on our blog (millinginternational.com) that we will be posting videos, pictures and other articles that we have accumulated at the show itself so a big thanks to anybody that took part in those. If you exhibited a product at the show and would like it to be featured on millinginternational.com please feel free to get in touch with any of us here at IMD HQ. Next up we look forward to meeting you at Isrmax 2012, which takes place in India next month (13th-15th) where we are also serving as media-supporter. You can still book a stand at the show free-of-charge by contacting our International Sales & Marketing Manager, Darren Parris. Tom Blacker will be acting as Interim Manager for IMD. to move closer to my growing family. It has been thoroughly enjoyable getting to know so many of you and upholding the prestigious reputation that the IMD has in serving the global-milling community. Based on the tremendous achievements that we have celebrated this year I am confident for that reputation to go on from strength to strength. I am pleased that Tom Blacker will be acting as Interim Manager for the IMD until further notice, you can contact him for all things IMD on +44 1242 267700 or by emailing tomb@perendale.co.uk. Look out for Toms posts on our blog and as I will not be able say so later, enjoy your holiday celebrations! 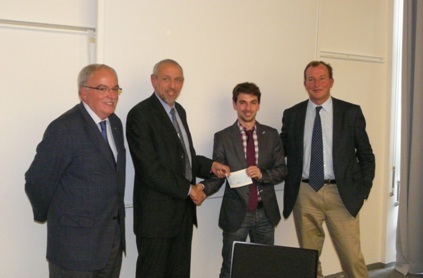 On November 13th 2012, at EUROTIER tradeshow, The European Probiotic Association (EPA) awarded the Jules Tournut Probiotics Prize 2012 to Peter de Schryver, from Ghent University, for his innovative research project on the use of microbial products and microorganisms in animal nutrition. The Prize was awarded in presence of members of the EPA, FEFANA, representative of the EPA Scientific Committee and journalists. Altogether, the quality and diversity of research projects submitted demonstrate that probiotics benefits go beyond zootechnical performance and pave the way for innovative applications in the field of immunity, but also stress management or even reproduction. From left to right : J. Brufau (EPA Scientific Committee), E. Auclair (EPA Treasurer), P. de Schryver and L. Dussert (EPA President). The aim of the EPA Jules Tournut Prize is to support research and innovation in the field of probiotics for animal nutrition. Professor Joaquim Brufau, from IRTA, who represented EPA Scientific Committee, which formed the judging panel of the award, highlighted the scientific quality and diversity of applications explored by the candidates, who came from all over the world, beyond the boundary of Europe. The studies submitted covered a range of target species and benefits, sign of the broad potential of probiotics for sustainable animal production. Peter de Schryver’s project aimed at improving performance and welfare in aquaculture thanks to an original approach: the use of poly-β- hydroxybutyrate (PHB), which he describes as a microbial energy storage polymer, an important source of energy for bacteria. PHB thus appears to play a prebiotic role in aquatic species, resulting in improved performance and resistance to pathogens. By combining this compound to a probiotic bacteria (synbiotic approach), the young researcher showed that both agents had a synergistic effect to protect fish against pathogens (use of Artemia franciscana as a well-studied model of aquaculture specie). Nevertheless, when asked if this new approach could be applied to various species Peter de Schryver reckons that “it could certainly work in land farmed animals that have an even more developed digestive system”. The use of PHB in synbiotic approach for animal nutrition thus appears as a promising field. With high feed costs, increased government regulations and consumer demands intensifying, the future of the poultry industry is difficult to predict. This was the focus of Alltech’s 10th Poultry Solutions Seminar, held in Hannover, Germany on the 12th of November, where a number of distinguished poultry industry experts gave presentations on their cutting edge research and on the issues that they believe will be of most importance. Antibiotic resistance is getting more and more publicity and governments are starting to take notice. Dr. Marcel Boereboom, of the Royal Dutch Society for Veterinary Medicine, discussed the impact this is having on the Dutch industry, following a study by the Dutch Health Council. He described how the government of the Netherlands have, to date, banned certain antibiotics and implemented a targeted reduction of 50% (of 2009 levels) of the total amount of antibiotics used in food producing animals by 2013. This has had a huge impact on how poultry is produced. Focussing on how to deal with this issue was Professor Stephen Collett from the University of Georgia. He recommended a shift in emphasis in gut health management, from working against pathogens, to working with the intestinal microbial community. This involves improving performance by accelerating the evolution and maintaining the stability of favourable intestinal microbiota. The three most important areas of an effective intestinal health management programme include: “seeding” the gut with favourable organisms, “feeding” the favourable organisms and “weeding” out the unfavourable organisms. Professor Roselina Angel, of the University of Maryland, described to attendees at the Poultry Solutions Seminar research on how neonatal conditioning, resulting in epigenetic changes shows great promise in terms of improving phosphorus (P) utilisation. “By applying a moderate P deficiency in young chicks, the bird is conditioned to utilise P more efficiently throughout its life. The timing of the conditioning is critical and requires a clear understanding of skeletal growth, the main driver of calcium (Ca) and P requirements,” she explained. Controlling campylobacter, a bacteria that poses no danger to poultry, but is the leading cause of human bacterial gastroenteritis, was the topic of Professor Frank Pasmans’ presentation, researched at Ghent University. When a single bird is infected, the infection spreads quickly through the flock, resulting in the majority of birds being colonised within only a few days after Campylobacter entry. He explained how, overall, the outlook is bleak if the flock has been infected but results of recent studies, using oral administration of bovine or chicken immunoglobulins of hyper-immunised animals and the use of bacteriocins to limit caecal colonisation, look promising. “We are still quite a way from commercialised products but the future does seem to be positive,” he explained. To deal with unpredictable feed costs and an inconsistent supply, Professor David Roland of Auburn University, recommends his “econometric approach to the feeding of layers. “Feeding correctly is challenging because nutrient requirements and dietary levels needed for optimal returns are continually changing” said Prof. Roland as he opened his talk. He presented his calculation tool called Econometrics to attendees, demonstrating how optimal econometric feeding can improve performance, returns and help regulate feed and egg prices at the same time. The machines cleanup columns, in conjunction with BiopureTM 13C labeled internal standards, achieve new performance levels in LC-MS/MS analysis and furthermore, BiopureTM 13C isotope-labeled internal standards overcome the ionization effect by stabilizing the system to the effects of signal suppression and signal enhancement. Thanks to 30years of experience, Romer Labs has developed a series of method applications using this new approach of a MycoSpinTM cleanup with BiopureTM internal standards. These methods are validated for the simultaneous detection of multiple mycotoxins in cereal grains, mixed feeds, and corn, including corn by-products. Romer Labs is the leading company in LC-MS/MS applications for multi-mycotoxin analysis. Its broad range of innovative products include the largest portfolio of reference materials worldwide, as well as a series of cleanup-columns for extract purification ranging from the well-known MycoSep® columns to specific antibody-based immunoaffinity StarLineTM columns. Romer Labs, founded in Washington, in 1982 is a leading developing manufacturer of test kits for food allergens, food pathogens, mycotoxins, veterinary drug residues and other food contaminants. The company also operates four accredited, full-service laboratories on three continents. Romer Labs has facilities in Austria, Brazil, China, Malaysia, Singapore, UK and the USA. For more than 30 years, Romer Labs has been a trusted partner for the food and feed industry worldwide. Today I am pleased to welcome a brand new company to the IMD community. Biochem Zusatzstoffe Handels- und Produktionsgesellschaft mbH are an efficient and environmental sound animal nutrition expert. Better known as Biochem, for more than 25 years the company has developed its product portfolio according to the varying demands of animals, humans and the environment to comply with its motto “Feed Safety for Food Safety®”. It is an international organization in no small sense with stations in France, Ukraine, Russia, Poland, Serbia, Iran, Egypt, Romania and Turkey and a network of distributors throughout Europe, Africa and Asia covering more than 50 countries. At the headquarter, based in Lohne, North-Western Germany, more than 90 employees care for development, production, registration, marketing, logistic and sale of products suitable for all animal species. I would like to thank Biochem for their interest in IMD and of course welcome them in what I hope is the beginning of a long and fruitful relationship.